As part of a special issue on natural hazards, this paper reviews the current state of scientific knowledge of Australian heatwaves. Over recent years, progress has been made in understanding both the causes of and changes to heatwaves. Relationships between atmospheric heatwaves and large-scale and synoptic variability have been identified, with increasing trends in heatwave intensity, frequency and duration projected to continue throughout the 21st century. However, more research is required to further our understanding of the dynamical interactions of atmospheric heatwaves, particularly with the land surface. Research into marine heatwaves is still in its infancy, with little known about driving mechanisms, and observed and future changes. In order to address these knowledge gaps, recommendations include: focusing on a comprehensive assessment of atmospheric heatwave dynamics; understanding links with droughts; working towards a unified measurement framework; and investigating observed and future trends in marine heatwaves. Such work requires comprehensive and long-term collaboration activities. However, benefits will extend to the international community, thus addressing global grand challenges surrounding these extreme events. 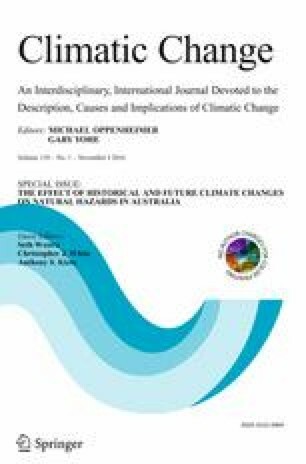 This article is part of a Special Issue on “The effect of historical and future climate changes on natural hazards in Australia” edited by Seth Westra, Chris White and Anthony Kiem. S.E. Perkins-Kirkpatrick is supported by Australian Research Council grant number DE140100952. L.V. Alexander and E.C.J. Oliver are supported by Australian Research Council grant number CE110001028 and G. Boschat by Australian Research Council grand number DP140102855. T. Cowan and A. Purich are supported by the Goyder Institute for Water Research, and the Australian Climate Change Science Program. J.P. Evans is supported by funding from the NSW Office of Environment and Heritage backed NSW/ACT Regional Climate Modelling (NARCliM) Project and the Australian Research Council as part of the Future Fellowship FT110100576. This paper was a result of collaboration through the ‘Trends and Extremes’ working group as part of the Australian Water and Energy Exchanges Initiative (OzEWEX).